Outlook backup software must be at hand for any system administrator or user concerned to protect E-mails and other data. As the internal Outlook backup add-in seems to be obsolete for now, the third-party software, such as Handy Backup, must be used for saving Outlook data. Handy Backup provides a powerful Outlook backup feature, which is able to automatically backup Outlook emails and other data (including any single PST file, Outlook contacts and event lists). Restore Outlook backup is as simple and automated procedure as taking a backup Outlook copy. Handy Backup can backup Outlook 2016, 2013, 2010 and earlier versions, along with MS Exchange backup and saving email backup directly from clients or servers. It can automatically backup emails in Outlook 2016 and other versions via the dedicated "Outlook" plug-in. Using the Volume Shadow Copying service (VSS), Handy Backup can backup Outlook data without stopping the Outlook program itself. In addition, Handy Backup is very undemanding to resources, so it does not drop overall speed of job when running. The restoration procedure for Outlook data is as simple as the backup process, using the same interface and methods described. Just create the restoration task, select the copy needed to restore and run the task to quickly replace your Outlook data. You can use the: MS Outlook" plug-in not only to backup Outlook but also to restore or migrate data, such as for backup emails in Outlook 2013 and then restore it to some other machine with Outlook 2016 pre-installed, or even move its content (in EML message formats) to some email services. Any edition of Handy Backup can automatically backup Outlook data. No additional installations or investments are required to use this feature at full scale. Get Professional edition, the mighty Outlook backup software solution capable of managing all your mail data protection in just a few clicks.! 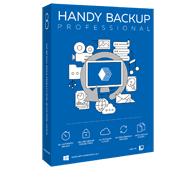 Along with Outlook backup, Handy Backup can automate saving copies of any other data types, providing a strong and convenient backup tool for all the needs of data security. Backing up in native format. You can back up files and then use copies any time you need it, as Handy Backup saves files (e.g., in PST file format) and other logical data keeping original format, requiring no restoration for using this data. Scheduling backup tasks. Your data, e.g., Outlook account, can be backed up automatically on a regular basis defining a period from minutes to months, ensuring you can always restore the actual version of your data. Wide choice of storage media. Backup information on local and remote hard disks, USB external and flash drives, commercial clouds, NASes or FTP servers. Advanced editions of Handy Backup will give you even more variants of backup storages. Additional backup capabilities. Handy Backup saves any data you need to save, not only emails. Add all your data that you need to save in a single joint task and schedule backup. 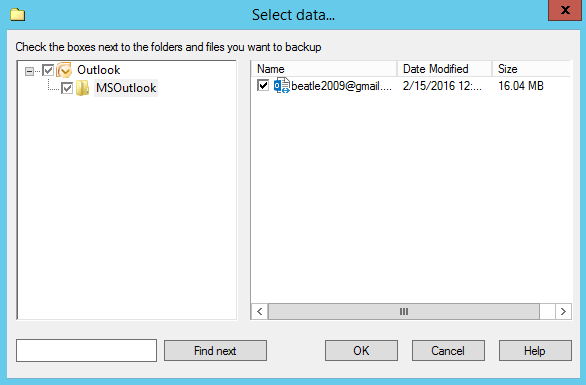 You can also encrypt or pack data when performing such tasks as Outlook 2016 automatic backup. You can run Handy Backup under any edition of Windows, including Windows 10/8/7/Vista and server editions of Windows such as Windows Server 2016, Windows Server 2012/2012R2, Windows Server Essentials, Windows Server 2008 (with 2008 R2). As usual with Handy Backup, the process of Outlook backup is quite simple. Doing it step-by-step, you can backup MS Outlook data without any special effort. Run Handy Backup and create a new task by selecting "New task…" from menu or just by pressing Ctrl+N. Choose a backup task type. On a Step 2, select "Outlook" from the list of backup data options in the "Email" section of the left panel. Click twice on it, or click the "Add…" button. The new window called "Select data…" will appear. Mark the checkbox near the "Outlook" option. You will see the list of Outlook, Outlook Express and Windows Mail folders. Press "OK" to return to the task configuration process. 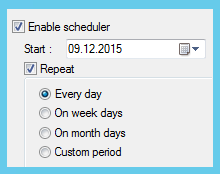 Select other settings, such as destination, compression and scheduling. These steps are not specific for Outlook backup. As you can see from this article, you can utilize Handy Backup as Outlook backup software with a highest level of efficiency. Tuning and scheduling tasks to backup Outlook, users can assure the total security and consistency of all emails under their Outlook accounts. 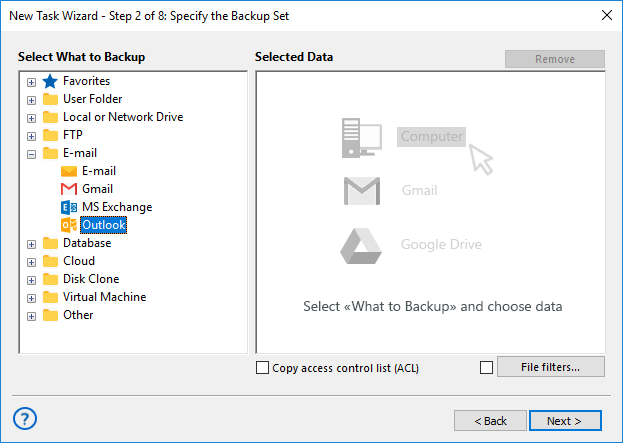 Handy Backup provides a powerful Outlook backup feature, able to automatically backup Outlook emails and other data (including any single PST file, Outlook contacts and event lists). Restore Outlook backup is as simple and automated procedure as taking a backup Outlook copy. 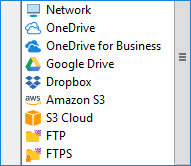 Try the power of MS Outlook backup with Handy Backup, downloading it just now from the official product downloading page for a 30-day free trial period! Reliable backup solution at a good price point and with nothing unnecessary. You pay only for those features you really need. I purchased the DVD+Service version and forgot about lost files as well as about the program itself because it works in the background and does not eat much system resources. I'm 100% happy with running Handy Backup. Well done novosoft, first backup program i've ever liked.